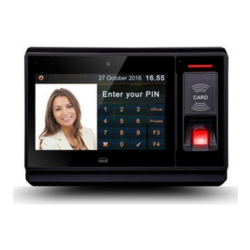 We have complete range of Time Attendance, Access Control, Green Label, Video Surveillance, and Smart lock, POS, Biometrics, Entrance Control, Security Inspection and ECO Product etc. We are the trusted manufacturer and supplier of a huge variety of Biometric Solution Delhi to our customers. These are widely appreciated for its battery back up, low maintenance and high performance. This is the best method to identify human being in terms of behavioral traits and intrinsic physical. "Biometric Security" is a method of utilizing a physical identifier such as fingerprints, facial geometry, iris scanning or other unique physiological feature to identify and authenticate an individuals credentials to access a facility, network, device or computer, thus proving - you are whom you claim to be. Morpho operates personalization centers worldwide and supports its customers and partners in integrating and optimizing EMV smart card production and personalization. Constant cost effectiveness and agility are crucial to a successful personalization process. We offer a full range of Card personalization solution from central issuance to instant cards at branch issuance. Biometrics authentication (or realistic authentication) is used in computer science as a form of identification and access control. It is also used to identify individuals in groups that are under surveillance. ... Biometric identifiers are often categorized as physiological versus behavioral characteristics.